I can’t remember when I picked up this thin cookbook. It’s simple and not at all fancy. But if you cook and you grow a vegetable garden or fruit plants, you’ll soon accumulate cookbooks dedicated to cooking with vegetables and fruits. I have an abundance of them, including The Apple Cookbook, the Enchanted Broccoli Forest (and several other Moosewood volumes), Green on Greens, and my favorite all-time vegetarian book, Almost Vegetarian, which advocated flexitarian eating before that was a word. And, when the raspberries or green beans or cucumbers are piled on the counters, they are a lifesaver. Books like this are packed with recipes for dishes that use up lots of vegetables or fruits – and, in late August or September, that’s often what I am about. 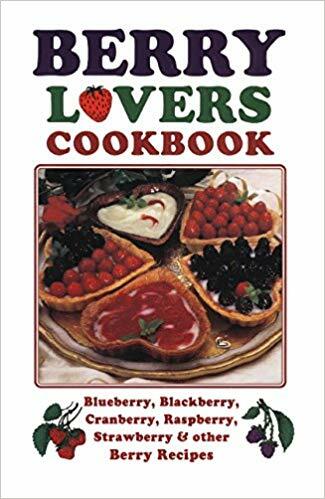 Not surprisingly, the berry book leans on the sweet side – recipes for jams and jellies, tarts and cobblers, pies and muffins. But it also has recipes for more savory fare, such as Cornish Game Hen with Blackberry Sauce or Gooseberry Chutney. Paging through a book like this gives the gardener/cook ideas and a bit of fortitude to deal with the masses of produce in your care. This holiday season, I’m hoping to receive The Northern Heartland Kitchen, a new book on seasonal eating by Beth Dooley, a Minnesota-based food writer. Its cover photo is a huge pile of lettuces and kale — just the kind of fare northern gardeners love to grow and eat. What are your favorite cookbooks for gardeners? Since joining a CSA for the first time this past summer, I have found tons of recipes to try (and enjoy) in “Local Flavors” by Deborah Madison, and “The Cooks Garden” by Ellen Ogden. Lots of great recipes using seasonal produce! Sandi — I’ve taken several of the Deborah Madison books out from our local library — they are great. I’m going to be reveiwing “The Cook’s Garden” later in this series. Aren’t CSAs great for inspiring good cooking and healthy eat? Ooops, forgot to mention that I have added your blog to my blogroll — Moorhead definitely counts as a northern garden! Thank you for all the veggie and fruit cookbook suggestions! With our changing diet, prompted by my DH’s diabetes diagnosis, I’m looking for lots and lots of complex carbs. Produce fills the bill, and provides other goodies like vitamins, minerals and complex flavors. My cookbook collection already contains “Greene on Greens,” my very favorite. He wrote not only about recipes but food history, culture and chemistry. There are goodly doses of humor in there, too!